Is sea level rise happening now? Satellite altimeters are currently (1993-present) measuring a rate of 3.3 mm per year of global mean sea level rise. Read more about what is causing the rise and how we observe sea level change globally. Are sea levels rising the same all over the world, as if we're filling a giant bathtub? No. Sea level rise is uneven, the two main reasons being ocean dynamics and Earth’s uneven gravity field. First, ocean dynamics is the redistribution of mass due to currents driven by wind, heating, evaporation and precipitation. For example, during La Niña events, sea level goes down because some rain that usually occurs over the ocean shifts to land, and the same phenomenon produces low latitude currents that redistribute seawater. Regional climate cycles, like El Niño and La Niña, and longer-term effects, like the Pacific Decadal Oscillation, change ocean circulation, which changes sea level. Second, because the distribution of Earth’s mass is uneven, Earth’s gravity is also uneven. Therefore, the ocean’s surface isn’t actually a perfect sphere or ellipsoid; it is a bumpy surface. As the land-based ice sheets of Greenland and Antarctica continue to unload their mass (lose ice) from far above sea level and far from the tropics, that mass reaches the sea in the form of meltwater that is then redistributed along Earth’s gravity field. 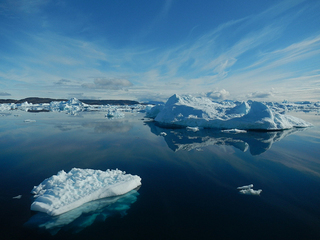 The areas farthest from the melted ice will see the most sea level rise as a result. Conversely, areas nearest to Greenland and Antarctica will see the least amount of sea level rise (and some areas will actually see sea levels drop). 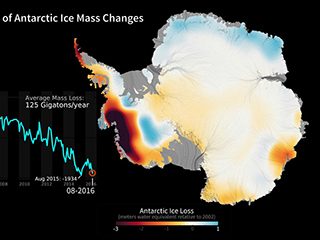 Scientists even track the annual cycle of ice sheet mass losses to further refine their sea level rise measurements. Between 1993 and 2018, sea level rose 12 to 15 millimeters per year (about half an inch per year) in some regions, and went down by that amount in others. But on average, it has gone up by about 3 millimeters per year (about 28 millimeters, or 1-1/8 inches, per decade) in that same period. Most of this unevenness is caused by ocean dynamics. 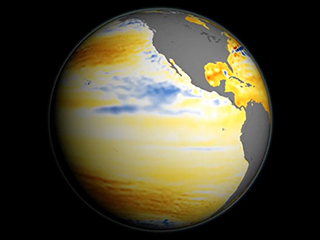 How does El Niño fit into the sea-level rise picture? Over periods of 2-8 years, after removing the overall trend of about 3 millimeters per year, the globally averaged sea-level rise closely follows the waxing and waning of El Niño. The main reason for this close match is that El Niño shifts rainfall from land to ocean, raising sea level. Its opposing phase, La Niña, shifts rainfall to land, causing sea level to drop. How much rise should we expect from Greenland and Antarctica? Currently the total sea level rise is about 3 millimeters per year (about 1/8 of an inch per year). Of that amount, about one-third comes from Greenland and Antarctica, one-third from glaciers like those in Alaska or the Himalayas, and one-third from the expansion of seawater as it warms up. In the future, we expect Greenland and Antarctica will contribute larger amounts. Changes in land water storage (e.g., water stored behind dams or withdrawn from underground aquifers, changes in global precipitation patterns and torrential rainfalls) also make a small contribution. Scientists also factor in vertical land motion changes due to subsidence and/or the rebounding of Earth’s crust since the end of the Last Glacial Maximum. Recently, spaceborne instruments have detected accelerations in ice sheet mass losses and sea level rise, which is expected when the globe warms, based on our understanding of Earth’s history and climate physics. You can read more about what is causing the rise and how we observe sea level change. How long have sea levels been rising? How does recent sea level rise compare to that over the previous centuries? Between about 21,000 years and about 11,700 years ago, Earth warmed about 4 degrees C (7.2 degrees F), and the oceans rose (with a slight lag after the onset of warming) about 85 meters, or about 280 feet. However, sea levels continued to rise another 45 meters (about 150 feet) after the warming ended, to a total of 130 meters (from its initial level, before warming began), or about 430 feet, reaching its modern level about 3,000 years ago. This means that, even after temperatures reached their maximum and leveled off, the ice sheets continued to melt for another 8,000 years until they reached an equilibrium with temperatures. Stated another way, the ice sheets’ response to warming continued for 8,000 years after warming had already ended, with the meltwater contribution to global sea levels totaling 45 additional meters of sea level rise. From about 3,000 years ago to about 100 years ago, sea levels naturally rose and declined slightly, with little change in the overall trend. Over the past 100 years, global temperatures have risen about 1 degree C (1.8 degrees F), with sea level response to that warming totaling about 160 to 210 mm (with about half of that amount occurring since 1993), or about 6 to 8 inches. And the current rate of sea level rise is unprecedented over the past several millennia. How much do human activities contribute to sea level rise? Many lines of evidence demonstrate that human activities, especially greenhouse gas emissions from fossil fuel combustion, are primarily responsible for the climate changes observed in the industrial era, especially over the last six decades. Human-induced greenhouse gas emissions are the only factors that can account for the observed warming over the last century that is driving the observed sea level rise; there are no credible alternative human or natural explanations supported by the observational evidence. Previous estimates show that human activities are responsible for about 70 percent of the observed sea level rise since 1970, with the percentage approaching 100 percent the closer to the present we come.